There’s nothing like reading aloud as a family on a long winter night, and some of our favorite children’s book authors have new books to take the chill right out of the brisk Iowa air. Here are a few of my favorite new children’s books that are suitable for the whole family. All three are available through the Metro Library Network. Who knew there was a secret sauce that turns you into a robot? And it’s made with common household ingredients, like plaxico powder and a sprig of sparkenfarfle! Well, one little boy discovers the secret, but it doesn’t turn out the way he thought it would when robots take over the book and turn it into an ultra-shiny ROBO-BOOK! I’m not sure which I like more – the story or the artwork. 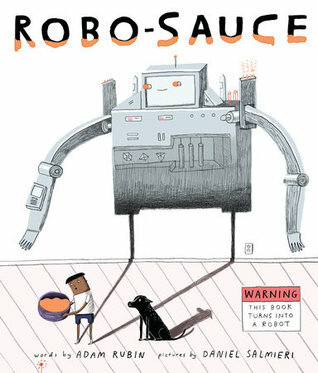 Robo-Sauce is a fun family read with words by Adam Rubin and pictures by Daniel Salmieri. If you like their book Dragons Love Tacos, you’ll like this one, too. 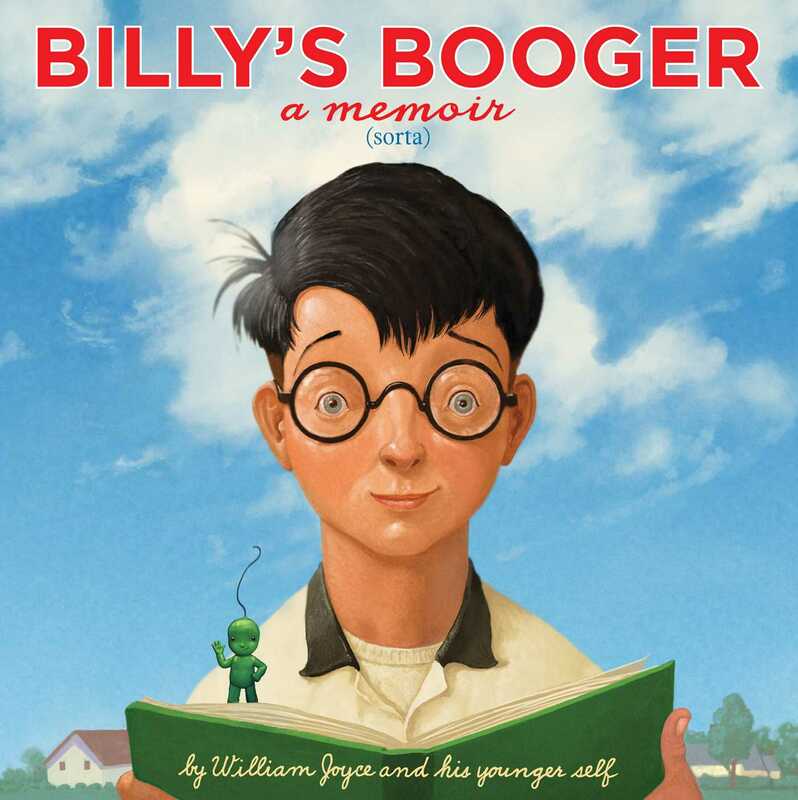 The ingenious Billy’s Booger is a book within a book by the very clever William Joyce. Apparently, Joyce’s writing career started in the fourth grade with Billy’s Booger, the memoir of a booger who becomes endowed with super powers, becoming “faster than a speeding spitball” and “more powerful than the meaniest bully”. Billy’s school principal dubbed him the “most challenging student”, but Billy was not deterred from the challenge of writing and illustrating his own book. Billy didn’t win a storytelling award, but the book is pretty awesome and has its own rewards. I thoroughly enjoy reading Aaron Reynolds’ books for children – his Chicks and Salsa is one of my favorite read alouds. So, when I saw Nerdy Birdy on our New Books shelf, I grabbed it. 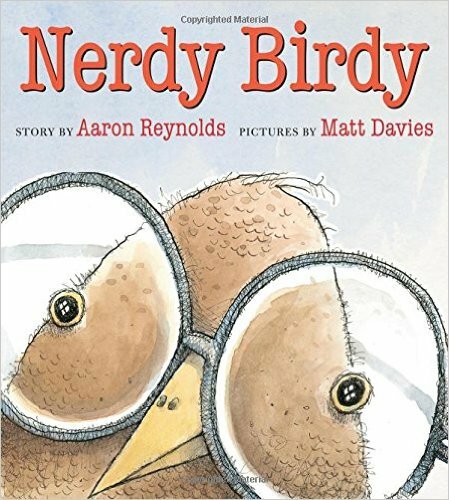 It’s a great little story about a lonely Nerdy Birdy who feels a little outshined by the Cool Birdies who sing, fish, or sport glossy red pompadours. Nerdy Birdy is good at three things: reading, playing video games, and reading about video games. Eventually, Nerdy Birdy discovers a whole bunch of other Nerdy Birds who want to befriend him. But when a lonely vulture moves into the neighborhood, new friendships are put to the test. I think you’ll agree that Nerdy Birdy handles it beautifully. An important message – a sweet book.